Isn’t that close to a profit maximizing marketer’s Holy Grail? People walk into the store and each one pays a price that is specific to them – their price at which they are happy to get the product over keeping the money. Granted we would like unbounded upper limit – not constrained at $929 and we do not want it to be a random price, we want each customer to pay precisely the exact price they are happy to pay to get the product. That is impossible in practice and likely is illegal. You wouldn’t like it that I get to pay only $199 for iPad Air (because I am far too happy with my iPad2) and you have to pay $879 because you just pulled up in your Tesla. I also will not like it when they pick a random number and ask me to pay that price. Except of course if it is like a Becker-Degroot-Marschak method where they ask me to first write down my price between$499 and $929, then they pick a random number between these two. If the price I wrote down is higher than the random number they picked, I get the iPad Air at the number they picked, otherwise I walk out losing my chance to be “awesome” and damned to eternity in Luddite world. Since forcibly charging different prices for different customers or randomly asking them to pay different prices is not possible, Apple has the next best thing in pricing – making customers willingly self-select themselves to pay the price they want by choosing the particular product version they want. 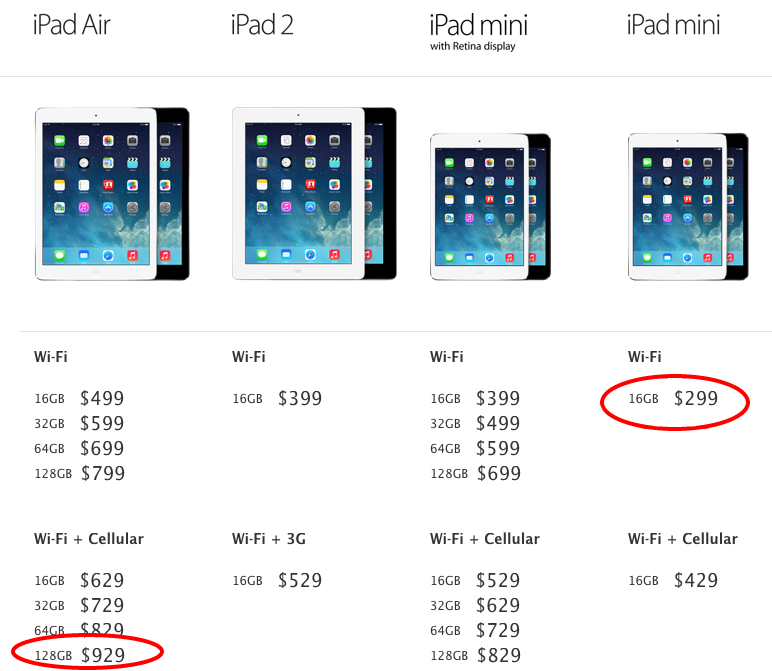 That is why Apple offers 8 different iPad Air versions to spread the price spectrum from $499 to $929. In some sense Jimmy Kimmel is not all wrong in saying, “randomly pay”, you could argue arrival rate of customers is random and the version they will like and buy is also random. Only thing is customers willingly pay that price and the marketer enables this with multiple price points. Do not for a second think the prices are different because of the cost. You do not believe it costs Apple $300 or even half that to go from 16GB to 128GB do you? Compare this to cost of going from hard drive to flash in non-Retina MacBook Pro and you will understand. The prices are different because we are different and we all value products differently and willingly pay higher prices than others for the same product. That is just versioning done right. In fact the price spectrum for iPad is wider than $429 to $929. If you include iPad2 it is $399 to $929. If you include iPad mini and mini Retina is is $299 to $929. There is no one price to rule them all. You build and deliver products at multiple price points to let customers choose the price they want to pay. Before you go and introduce versions at dozen different price points, see also 4 costs of versioning. At the high end, Apple could sell as many as 58 million (full year), but those chances are very very slim (1 percent). Considering all the possible scenarios, the expected value of volume is 40 million. 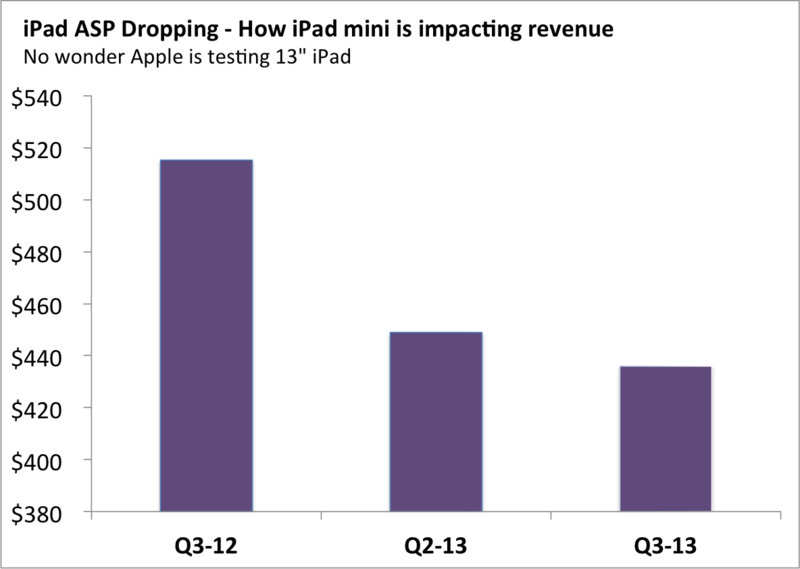 Apple released its Q1FY13 earnings today, let us estimate how many iPad minis Apple most likely sold. The iPad mini numbers are based on the Apple‘s report. They sold a total of 22.8 million iPads (new iPad, iPad2 and iPad mini), compared to 14.03 million in the previous quarter (pre iPad mini). If you were to attribute all incremental volume to iPad mini it comes to 8.77 million. I could stop here and say my model is correct. 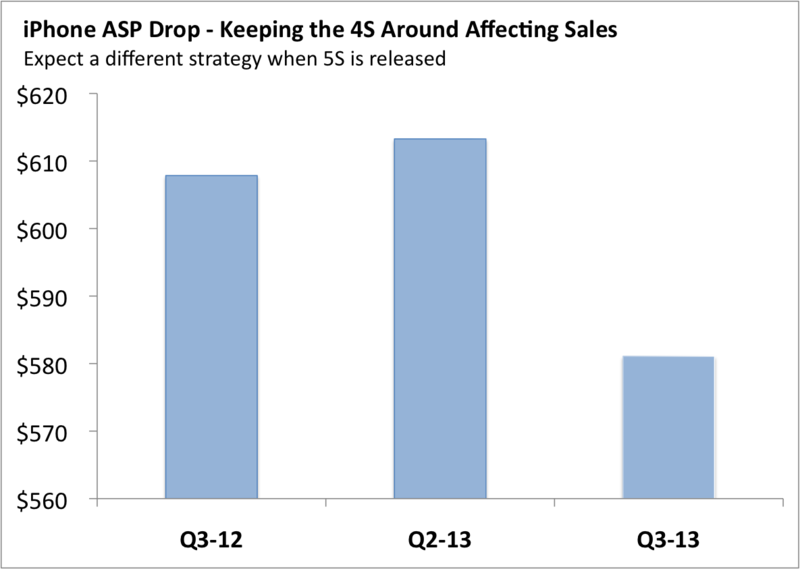 If you compare the Average Selling Price (ASP) between two periods, in Q4FY12 the iPad ASP (iPad and iPad2) was $508 but it dropped to $467 this quarter (Q1FY13). So let us plug in these numbers into the model I recently built to estimate the number of iPad minis Apple sold. We find that the 8.77 million is actually the lower limit. 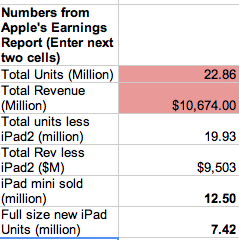 With the assumptions I have made, Apple likely sold 12.5 million iPad minis (all editions combined). Apple put on some impressive iPad mini numbers. Did it cannibalize its full priced iPad? You bet it did. Last quarter Apple sold about 9.84 million full size iPad. (Again see the model.) That number dropped to 7.42 million units, thanks to iPad mini. So a cannibalization of 2.42 million units — that is 2.42 million people who would’ve chosen full size iPad chose iPad mini. How did I do with my previous prediction of iPad mini numbers in my GigaOm article? I predicted an annual expected volume (considering all possible scenarios) of 40 million. But Apple could end up selling at least 50 (4 times 12.5) million iPad minis in FY13. What did my model say were the chances of selling 50 million (full year) units or more? As Galbraith said I could get busy arguing that is still within my scenarios and I am still correct. Galbraith’s writings have influenced my thought process in many ways, I will note his warning and not get busy with my proof. It indeed appears I had started with some overly conservative numbers on iPad mini uptake based on the survey results I had used. Hence my model underestimated the iPad mini volumes considerably as iPad mini yearly volume could be 50-60 million units. Model is only as good as the informed input we start with. After all we are paid to make better hypotheses and make informed assumptions. Apple is asking shoppers to pay a 65% premium — which they are, gladly. You can put me in that group. These are big claims. Note that he is predicting $2.2 billion profit from just one product line and that too operating profit not gross margin. Just as a refresher, gross margin is revenue less Cost of Goods Sold (COGS) for that product line. Operating profit is after R&D, sales & marketing and other operational expenses. In the last quarter Apple made $11B in operating profit, so Motley Fool is predicting 20% increase over last quarter just due to iPad mini. What is the basis for this? Well we know this blogger bought one and hence he believes millions did so as well. But after that we do not know how he did his math to show $2.2B as operating profit. At the low end they could possibly lose $1.7 billion and at the high end they could make $2.5 billion in profit. But the chances of both these scenarios are just 1 percent. And so realistically, considering all possible scenarios, the expected value of profit is half a billion dollars—and that is gross profit, not including marketing and other costs associated with iPad mini. From my more rigorous statistical modeling I predicted the best case scenario is $2.5 billion gross margin for the entire year and the chances of that happening are just 1%. So for Q1 numbers let us assume even distribution and divide my numbers by 4. That gives $125 million as expected profit and $625 million as 1% possibility. How can Motley Fool predict such large numbers? Second difference is I took into account the negative effect of iPad mini on other product lines. That is iPad mini is not all additive, there is cannibalization. Using customer research data I included that effect (accounting for the uncertainty in the cannibalization rate) in computing net profit from iPad mini. Finally I am not sure if Motley Food did any math at all. They say Apple would sell 20 million total iPad units (mini and maxi?). Since last quarter Apple sold 15.4 million iPads last quarter that would mean 4.6 million iPad mini (and by their assumption there was no cannibalization). So $2.2B in operating profit from mere 4.6 million units. That is each unit contributed $478 in operating profit. Really? Far more than the likely ASP of iPad mini and more than gross profit from iPad line. What kind of investment analysis or math is that? I hear this site gives investment advice, I wonder. Lastly, I do stand by my model. Just wait a week more and plug in the numbers from Apple’s earnings report into this model and find out. Note: Some have pointed out in GigaOm comments section that I used too conservative a number for iPad per unit profit and that iSuppli had a different (higher) margin prediction. My mean was 32% with sigma of 4.6% while iSuppli says the numbers are 42%. Even if I adjusted my mean to use iSuppli numbers, my predicted BEST CASE (2% chance) gross profit will utmost go to $0.8B per quarter and not $2.2B Motley Fool predicts. Today there was a survey out from Cowan and Co that got written about in almost every blog. It is about the effect of iPad mini on iPad sales. Most quickly jumped to the obvious conclusion (in articles with catch headlines too) that iPad mini will go on to add significantly to Apple’s profit with “inconsequential” cannibalization of iPad. Here is my representation of the survey results using the data from Cowan and Co and let me tell about the problems with this survey and hence the conclusions. 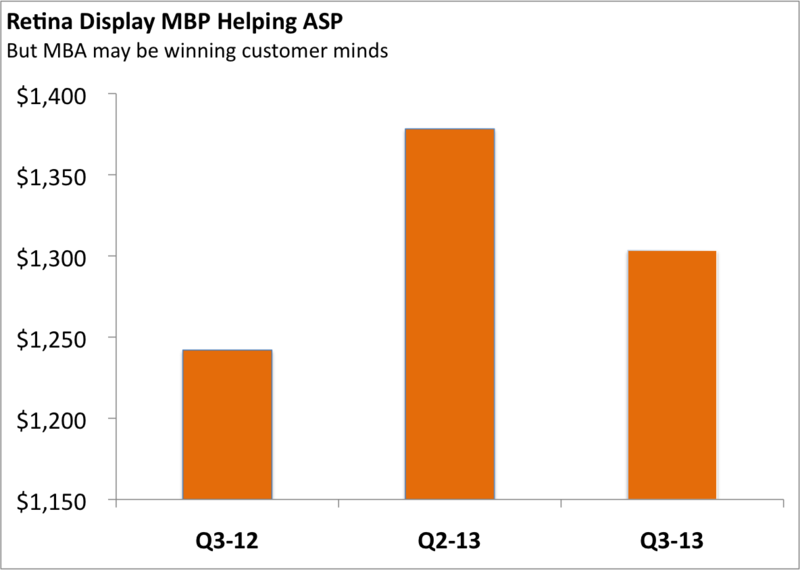 First this is a stated preference study measuring the attitude of the customer and not the actual behavior. It is well established in marketing research literature that stated preference surveys overestimate behavior at point of purchase. Second the survey question was specific to iPad mini, asking them specifically if they would buy iPad mini in the next 18 months. They did not ask them about other tablets in their consideration set nor did they ask them if they planned to purchase Kindle Fire, Nexus or nook. That is too narrow, anchors them on single choice and ignores other possibilities. Had they asked, “Which tablet will you buy?” and reported percentage distribution of different tablets it would have been much better. Third, they slice and dice the 24 samples who reported switching from another device to report cannibalization and conversion from other tablets. The number 24 is too small to make any meaningful estimate, especially when 8 report switching from iPad and 3 report switching from Fire. If these were accurate estimate then it also point to even smaller impact on Kindle and other tablets. Fourth, a more significant problem with the question “What device will iPad mini replace?” is it is just plain wrong as respondents were not primed to compare price and value of each. One right way is to do a (choice based) conjoint analysis to find the respective share of different tablets – iPad, iPad mini, Fire, Nexus etc. Fifth, let us take the 6.1% new buyers number at face value. 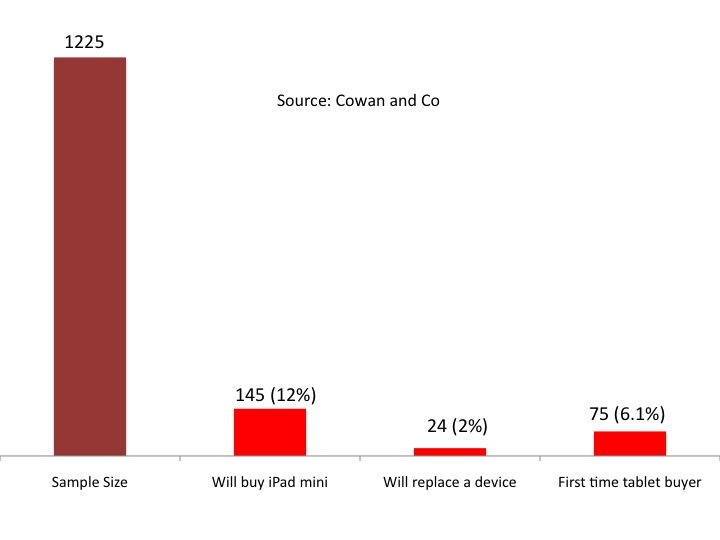 You can interpret this as 6.1% of all those who would buy a tablet would choose iPad mini. That is, iPad mini is not bringing in many new buyers into the market. Had they asked what tablets would they buy this number would likely pale in comparison to others. So it is overreaching to say, “its low-price will bring in new customers”. Netting it out, there is not enough validity in the data to make bold predictions about iPad mini. There are indeed many uncertainties and those are not considered let alone quantified by this study. What you have is someone’s wishful thinking supported with non-scientific sampling and analysis. For the record. 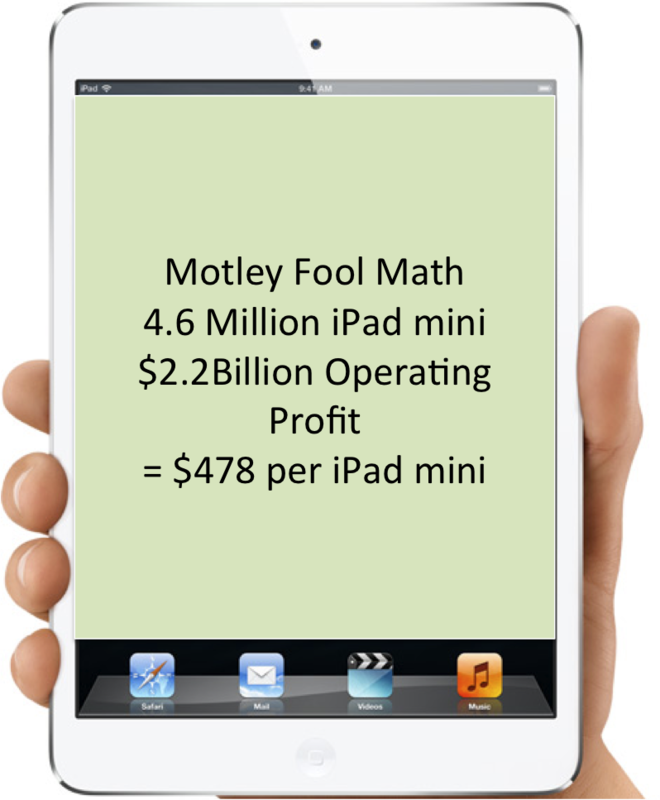 here is my statistical analysis on iPad mini numbers and incremental profit it would drive.